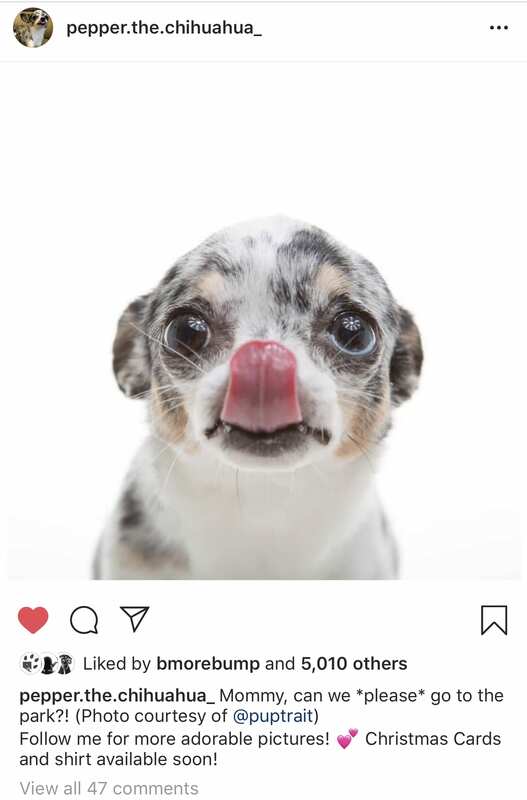 Photo credit: actual screen capture of Pepper the Chihuahua going viral on Instagram with one of the photos from her Puptrait Studio session. You already know your dog is amazing, but now it’s time to show the rest of the world! Starting an Instagram account for your best dog friend can be a lot of fun. But if you don’t know what you’re doing posting on Instagram can feel a lot like you’re talking to yourself. What’s the point of posting if no one is going to see your amazing photos or your adorable furry friend, right? Here’s a check list of 10 easy things you can do to help get your dog’s cute photos more likes and how to make your pet famous on Instagram compiled by your friendly neighborhood professional pet photographers. You don’t need an expensive or boogie photographer camera to take better photos of your dog. You might be surprised to hear a professional dog photographer say this, but smart phone cameras these days are actually great. The trick is to understand the limitations of your device and appreciate the kinds of photos that it actually does a great job capturing. To take better photos of your dog with your phone camera you are going to want to get up close to your dog, minimize background distractions, and make sure that your dog is properly lit. In photography, lighting is paramount. Lighting your dog properly will help bring out details in their fur and snout, prevent blurriness from the dog moving or camera shake, and sharpen the photo. Brighter scenes appear crisper and sharper for a number of reasons – they allow faster shutter speeds to reduce shake, smaller apertures (the width of the opening on a lens) that widen and increase focal distances, they remove noise by reducing ISO (decrease the sensitivity of the sensor removes random bright spots from appearing in darker areas), and light improves clarity by increasing gamut contrast in a scene (Relatively speaking, you can’t have dark without light, right?). A lot of dog owners worry about using flash when photographing their dogs. But it is safe to use flash when photographing dogs. In fact, when working comparing brighter light sources, flash photography tends to be much less distressing for dogs than persistent light sources. Avoid using the flash on your phone to take photos of your dog. Using the flash on your smartphone is almost always a bad idea. The LED flashes on smart phones are often located right next to the camera, resulting in more washed out features, more red eye, and more glare as it is easier for light to reflect directly back towards the camera when the light source is that close to the camera. Natural light tends to work great, but if you have to take photos at night or in a room with few windows or poor sun exposure, don’t be afraid to use a lamp, flash light or a reflector (aluminum foil wrapped tightly on a piece of cardboard or a pan can do wonders). If you absolutely have to use the flash on your phone, see if you can’t borrow a phone from a friend instead. Put this second phone in flash light mode and hold it at an angle towards your dog. Last but not least, don’t forget to clean your lens. If your phone spends most of its time in your pocket or purse, odds are it will attract lint, dust, dirt and other grime. A quick wipe with a clean soft cloth can go wonders to remove unwanted artifacts and smudges. While we would never advise cleaning a more expensive DLSR lens this way, a softer t-shirt or sweater will do just fine if you need to clean your camera phone lens in a pinch. Every dog is unique. They have unique physical features, mannerisms and expressions. Is your dog a rare breed or have a unique trait that is an unusual variation of a more common breed? What about a thing that they always do at bed time or when begging for a treat? Is your dog so ugly that they’re actually kind of cute? Whatever it is that makes your dog special or endearing to you is what you should focus on. Chances are if you like whatever it is that makes your dog special other people on Instagram will also find these traits interesting. When posting make sure that you are not only regularly discussing this unique trait, but also highlighting it in photos of your dog. Your followers will expect you to be consistent so they can know what to expect when you post and people who aren’t following you on Instagram yet will be swiping past only one of your photos in a field of a hundred others, so highlighting an obvious trait can be tremendously helpful to both building and maintaining a following on Instagram. You might want to make money from your dog’s newfound Insta Celebrity status, but do NOT mark your account as a business. Both Instagram and Facebook profit almost exclusively from paid advertising from businesses. For the last few years this has pushed Instagram to provide increasingly less organic impressions to business accounts as they attempt to push businesses to spend even more money to be seen on their platforms. We’ve seen this in effect first hand happen multiple times. Our studio (a business) will post a photo and attract 25 likes, while one of our clients will post the same photo with an identical description and the exact same hashtags and attract 25 thousand likes. So, if you want to make your dog famous on Instagram it is absolutely critical that you make them a personal account. Don’t worry, if you have the following that would attract a paid placement, you can still post promotional content on your dog’s personal Instagram page. Hash tags have become increasingly important over the last few years. They help describe your dog photos, allow for search engine crawlers make sense of your dog’s content and make photos of your dog searchable on Instagram. It’s not unusual for more engaged Instagram users to follow hash tags. For these reasons it is very important to use hash tags if you would like to make your dog famous on Instagram or attract more Instagram likes for your dog photos. When thinking about hash tags you want to find popular hash tags. It’s important to keep in mind that finding the right hash tag for your post may mean more than selecting the most popular hash tag. Remember to focus on what makes your dog different and special. This is especially true of breeds. Some breeds have very active but small followings. These more engaged groups of Instagram users, while smaller in number, may actually result in more likes and followers for your page simply due to how active they are and how relevant your content is. This is one of the most ignored steps to Instagram success and one of the hardest to nail down. Always strive for consistency. Try to post the same type of content, similar images and around the same times of day. By being consistent you are helping to show users what to expect and making it easier for them to engage with your content on a regular basis. This is important as user engagement is believed to be part of Instagram’s algorithm that helps determine what content is promoted or hidden on their network. Which when you think about it makes a lot of sense. Instagram wants users to enjoy themselves and consume enjoyable and relevant content. If user feeds were loaded with content that they didn’t want, like or enjoy then they would have little reason to come back regularly to check their feed. As a general rule of thumb, you want to post content that people enjoy and can easily consume. I realize that’s easier said than done, but it really is the key to success and popularity on all social media platforms, including Instagram. The vast majority of the digital world follows pretty cyclical and predictable trends. People (and dogs) get up early, go to work or school, break for lunch, go home, eat dinner, veg out and then go to bed. This is something I personally struggle with. Like most pet portrait photographers, our studio tends to cater primarily to clients who work during the day and to accommodate their schedules keep fairly late hours, closing up shop as late as 10PM. Our hours may be later, but as our clients keep to an earlier schedule it’s important that we try to engage followers earlier in the day. Think about when you check Instagram. Most people are the most active right after they wake up or right after settling in at the office, usually right after they’ve finished checking their emails in the morning. Then most people see a slight boost of activity while on their lunch break and then maybe again while walking their own dog. But those examples may not fit your dog’s personal brand. Try to think of a couple use case scenarios that would fit your “typical” follower and just stick to that. If it doesn’t feel like its working, shake it up a bit and try something new. It’s not enough to just post photos of your dog – no matter how cute they might be. You have to engage with other dog lovers on Instagram if you ever want to build a truly huge following. Part of this is replying to comments on your dog’s Instagram feed, but more importantly, it also means following other dog accounts and engaging with like minded pet lovers. You might be surprised just how many dog accounts are only willing to follow another account after they’ve been followed. Be proactive. Be generous with those follows and likes, especially when viewing other dog pages – even ones that aren’t as popular on Instagram as your own. And above all — be kind! Follow those three rules and you’ll be making Instagram friends and attracting followers in no time. You may not be familiar with the term, but you’ve probably already experienced newsjacking without even realizing it. Newsjacking is the practice of exploiting current events, especially news stories, in a way that makes your content or brand more relevant. It’s basically a convergence of topical and timely, a method of promotion that allows you to advertise by cashing in on whatever the next hot trend or big story comes along. This could be a plot point in a popular TV show, a political snafu or any other kind of widely promoted event or occurrence that has grown in awareness to cultural meme — think Janet Jackson’s Super Bowl performance, the OJ Simpson trial or the release of the ASPCA’s sob worthy “Arms of Angel” TV commercial released a few years back. Parody and satire, are your friends. Don’t be afraid to take a new spin on what might be a tired or older meme. You might be surprised to see how well an older meme is received just by adding a dog to it. People like memes, but they love dogs. No one likes a negative Kaylee (sorry Nancy, you’re old news). Always strive to be positive and magnanimous. Celebrate the victories of your friends, family and the people you haven’t met yet. Remember, it costs nothing to be nice. You might feel like you need more followers than that other profile you’re “competing” with. But in all reality, Instagram isn’t a competition. You can’t win at social media. There will always be someone more popular than you or a new trend that will sweep up the attention, no matter how popular or well liked your dog’s profile becomes. Just look at how Kylie Jenner’s “Most Liked Instagram Picture” was supplanted by an Egg. Could anyone have predicted that as going to happen? Probably not (we doubt even the Egg poster thought it would work), but at the end of the day it did. Either way, it didn’t detract from Jenner’s popularity. She’s still crushing it on Instagram and has a ton of followers. Just imagine what your dog could do on Instagram with the right attitude. This is probably the most important tip on the list. Always strive to be authentic. Don’t promote an artificial or overly polished facade on social media. Let your followers into the day to day life of your dog. Adventures hiking and to the dog park make for great content, but it’s more important to let followers into the actual life of your dog. Don’t be afraid to post regular updates of more mundane activities or those lazy times. Often it’s the down time, the moments in which your dog is just laying around being adorable or goofy that make for the most memorable and engaging photos. Not to mention regularly posting low effort or less “special” photos will make it much easier for you to post more often and with regularity. Don’t forget the little people. As your dog’s Instagram account begins to gain traction and grows increasingly popular, it’s important to remember the people that helped get you there and that you continue to engage with the people who got you there in the first place – your followers. This goes hand in hand with our last tip about authenticity. There is nothing worse than following a personally run account and watching it go on autopilot, posting nothing but reshares, emotionally void content, and soliciting for features. Growing your account is a relatively simple task, but maintaining your following and continuing to grow after your initial successes is how real growth is achieved. Why not follow the Puptrait Studio on Instagram? Looking for stunningly creative and unique photos of your dog? Book a private portrait session for your dog at our studio or book an in-home pet portrait session anywhere in Maryland, Washington D.C., and Virginia. Professional pet portraits can be a great way to spice up your Instagram feed and give it the little extra umph needed to pull your page out of a creative slump. And don’t forget, all Puptrait Studio portrait clients receive social media friendly web ready digital files of all proofs from their session.